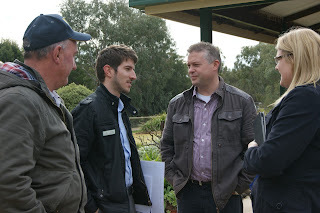 The State Minister for Environment The Hon Ryan Smith MP visited the Loddon Plains Landcare Network (LPLN) area on Wednesday the 25thJuly. Arriving aboard a coach with the North Central Catchment Management Authority (NCCMA) Board, the Minister paid a visit to the Loddon Vale Landcare Fishing Platform project on Serpentine Creek at Durham Ox. NCCMA Board member and LPLN President Laurie Maxted spoke about the Fishing Platform project and this was followed by lunch up the road at the Maxted family homestead. Over lunch the LPLN Facilitator, Anthony Gallacher spoke about the progress of the network to date, including the success of the workshops run in May and the advancement of the GOANNA project with the support of The Norman Wettenhall Foundation. The LPLN Committee of Management would like to thank the State Government for its support of the network through the Victorian Local Landcare Facilitator Initiative and the Victorian Landcare Grants Program. A special thanks to the Maxted family for their hospitality and a delicious lunch.